Kahan, Jeffrey. "Ambroise Paré's Des Monstres as a Possible Source for Caliban." Early Modern Literary Studies 3.1 (1997): 4.1-11 <URL: http://purl.oclc.org/emls/03-1/kahatemp.html>. What have we here? a man or a fish? dead or alive? A fish, he smells like a fish; a very ancient and fish-like smell . . . A strange fish! Were I in England now (as I once was) and had but this fish painted, not a holiday fool there but would give a piece of silver. There would this monster make a man; any strange beast there makes a man (II. ii. 24-31). The description is precise enough to have had commentators search contemporaneous texts for a source. However, their work is error-filled and incomplete. According to Vaughan and Vaughan, it is commonly supposed that Shakespeare may have used Conrad Gesner's Icones Animalium; in their work, the book is listed as being published in 1560. Vaughan and Vaughan further state that the book contains a picture of a strange man-fish. The picture, often reprinted, is commonly known as the "Seabishop picture" (see Figure 1). Vaughan and Vaughan describe the Seabishop as a "curious combination of rooster and fish" (77). Unfortunately, they are incorrect on several points: Icones Animalium was first published in 1553. It did not contain the history or picture of the Seabishop. An omnibus volume was published in 1560 but it too lacked the Seabishop. The history and picture of the Seabishop first appeared in Gesner's Historae Animalium (Volume 4), published in 1558. Further, despite Vaughan and Vaughan's evident confusion over the creature's feather-like scales, the creature Gesner describes has no rooster-like features. These misclassifications, while worrisome, do not in any way undermine the conjecture that the picture may have influenced Shakespeare's imagination. I do not dispute the possibility that Shakespeare knew of this picture. Nonetheless, I doubt Shakespeare consulted Gesner's Historae Animalium. Rather, I think it likely that Shakespeare found the picture in Ambroise Paré's Des Monstres et prodiges (1573), a popular Renaissance text that has linguistic, textual and pictorial ties to The Tempest. While the various points of my argument might be viewed individually as tenuous, together they present a strong argument in favour of this reattribution of source material. On the surface, there is plenty of reason to argue that Shakespeare had ready access to Gesner's book. The original Latin 1558 edition was republished in 1587 and 1604; a German edition appeared in 1563 and was republished in 1575, 1594 and 1598. Yet, even if Shakespeare was aware of Gesner's Historae Animalium, the subject matter of the work was evidently of little interest to him. Aside from the picture, nothing in any of Gesner's works have ever been linked to The Tempest, nor to any other play in Shakespeare. Nor were monsters of great interest to Gesner. Volume four of Historae Animalium is an index of fish. For the most part, Historae Animalium is accurate and scientific. Only on two pages in his work does Gesner depart from his strictly scientific observations, to discuss two creatures even he does not believe are real. 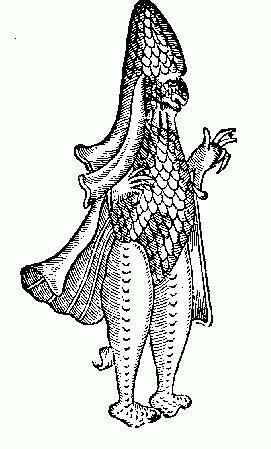 It was in the year 1531 when such a fish with such a shape, completely resembling a bishop, was caught on the banks of the sea at Poland and shown to the Polish King. The Seabishop, through signs, meanings and cravings, expressed his great desire to return to the sea. To which, when he was brought to it, threw himself into it and the deepness of the sea closed around him. I knowingly omit more details concerning this creature because I think they are fictitious (520). Shakespeare, we are to believe, combed through a book that was of evidently of no interest to him, looking for a small passage that was anomalous to the work as a whole. It is more likely that Shakespeare browsed a book that was of direct relevance to the play he was writing. Ambrose Paré's Des Monstres was published in 1573 and republished in 1575, 1579, 1585, 1598 and 1607. An English version was available in 1634, far too late for Shakespeare. Still, if we accept that Shakespeare wrote Henry V, III. iv., we must allow that his French was good enough to puzzle through a text as simple as Paré's. Not only does Paré's Des Monstres contain the history and picture of the Seabishop, but thematically, Paré's work would have been of great interest to Shakespeare. The Tempest is greatly concerned with monsters. The descriptive "monster" is repeated no less than 16 times in II.ii and an astonishing 38 times in the play as a whole. Nowhere else in the Shakespeare canon does the word appear with such frequency. Likewise, "moon-calf", used five times in the play as a description of Caliban, is listed in the OED as a specialized term for "misshapen birth, a monstrosity." If this repetition is indicative of an interest in the monstrous, Shakespeare may well have been attracted to Paré's Des Monstres et prodiges. Stephen Greenblatt has described the book as "a crucial guide to dominate ideas about the natural and the unnatural, the link between sexual practices and abnormal conception . . . ." It is not only concerned with monsters and their progeny, but is also concerned with exotic animals and explorations of the New World, themes that have all been tied to The Tempest. Paré's Des Monstres contains further specific textual and pictorial links to The Tempest which Gesner's text lacks. Stephano sees a creature that has "Four legs and two voices; a most delicate monster!" (II. ii. 89-90). While it is true that Trinculo is a normal human, he is perceived by Stephano as a Siamese twin. Paré includes a variety of drawings concerning Siamese twins that correspond to this creature (see Figure 2). Similarly, Trinculo describes himself as part-man/part water fowl: "Swom ashore, man, like a duck. I can swim like a duck, I'll be sworn" (II. ii. 128-9). To which Stephano replies, "Though thou canst swim like a duck, thou art made like a goose" (II. ii. 131-2). The image of a half-man, half-duck or goose is so preposterous, we are likely to dismiss the line as a simple comparison (I swim well. So do ducks. Therefore I swim like a duck). However, the passage bears remarkable similarities to details and pictures in Paré of hybrids of human and, variously, goat, dog, frog and marine creatures (see Figure 3). [to say] that from such a coupling some human creature can be engendered . . . is not only false, but contrary to our religion, which holds that there was never any man engendered without human seed, except the Son of God. Indeed, as Cassianus said, what absurdity, repugnance and confusion there would be in Nature, if it were legitimate for devils to conceive by humans, and for women [to conceive] by them! How many monsters--from the creation of the world to the present--the devils would have brought forth through the whole human race, casting their seed into the wombs of animals, thus creating, through perturbations of seed, an infinity of monsters and marvels! (94). On this point, Shakespeare is neither in agreement nor disagreement with Gesner, who again has nothing to say about such couplings. However, he is in agreement with some theological authorities, including King James, who allowed for the possibility of half-demon offspring (James 68). To summarize, it is commonly argued that Shakespeare's Caliban was in part influenced by the Seabishop picture. But the picture is found in two works, one by Gesner, the other by Paré. The first of these books dwells on a subject that apparently held little interest for Shakespeare, the other contains images and accounts that seem to correspond to passages found in The Tempest. I therefore suggest that the preponderance of evidence favours the reattribution of this source material to Ambroise Paré's Des Monstres. 1. All Shakespeare citations are from The Riverside Shakespeare ed. G. Blakemore Evans (Boston: Houghton Mifflin, 1974). 2. The copy of Gesner's Historae Animalium I consulted is housed in the McGill Osler History of Medicine Library. Figure 1, above, appears on page 520. I have checked it against another copy in McGill's Library of Biology. I am grateful to the Osler Library for permission to publish the picture. 3. At least the copies of Icones Animalium I consulted lacked the history and picture. The Renaissance practice of corrections and changes during a print-run raises the possibility of its inclusion in some copies. I think this is a remote possibility. The 1560 edition of Icones Animalium is a greatly abridged version of Gesner's five-volume Historae Animalium. The Seabishop was most probably judged as a superfluous entry and cut accordingly. 4. I have checked Kenneth Muir's Shakespeare's Sources (London: Methuen, 1957) and The Sources of Shakespeare's Plays (London: Methuen, 1977) and the MLA Bibliography on CD-ROM. In fairness, it should be noted that Paré's work has never been linked to any other play in Shakespeare either. 5. The Latin reads, "Monstrum aliud multo superiore mirabilius subiungo, quod accepi a Gesberto Germano medico, cuius ante aliquoties memini, quod ipse ad Amsterodamo cu literis accepterat: quibus ille affirmabot anno 1531, in Polania uisum id monstru marinum, Episcopi habitu, & ad Polania Regem delatum: cui signis quibusdam significare uidebatur, uehementer se cupere ad mare reuerti, quo deductus statim in id se coiecit. Sciens omitto plura, quae de hoc mon stro mihi narrata sunt, quia fabulosa esse arbitror." I am indebted to Professor M.C. Bolton of the Classics Department, Concordia University, for aiding me in the Latin translation. 6. Paré duly cites Gesner as his source for the history and picture (110). 7. I am indebted to Gaines' article for this reference to the OED (54). 8. Greenblatt's comments appear as a backcover "blurb" to Pallister's translation. They are reprinted with the permission of the author. 9. While Des Monstres may offer a source for Caliban's wish to people the island with his monstrous offspring, it should be noted that Shakespeare's interest in New World explorations has been linked to other sources as well. See Bullough 8:237 339. 10. Figure 2, above, was originally subtitled, "Figure of two monstrous children born not long ago in Paris" (Paré 17). Des Monstres pictures are owned by the Librairie Droz and are reprinted with permission. 11. 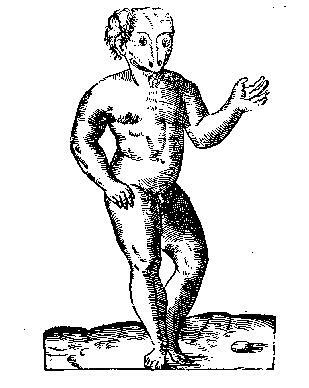 Figure 3, below, was originally subtitled "Prodigious figure of a child having the face of a frog" (Paré 41). 12. Again, I am indebted to Gaines' insightful article for the reference (53; 58, n.17). Bullough, Geoffrey. Narrative and Dramatic Sources of Shakespeare. Vol. 8. London: Routledge and Kegan Paul, 1975. Gaines, Barry. "What Did Caliban Look Like?" Shakespeare Yearbook 1 (Spring 1990): 50-8. Originally published in The Mississippi Folklore Register 10 (1976): 175-86. Gesner, Conrad. Historae Animalium. Vol. 4. Tiguri: C. Froschoverus, 1558. ---. Icones Animalium. Tiguri: C. Froschoverus, 1560. James I. Daemonology. Edinburgh: Robert Walde-grave, 1597. Muir, Kenneth. Shakespeare's Sources. London: Methuen, 1957. ----. The Sources of Shakespeare's Plays. London: Methuen, 1977. Paré, Ambroise. On Monsters and Marvels. Trans. Janis L. Pallister. Chicago and London: U of Chicago P, 1982. Shakespeare, William. The Riverside Shakespeare. Textual Editor G. Blakemore Evans; Gen. Introductions Harry Levin, Herschel Baker, Anne Barton, Frank Kermode, Hallett Smith, Marie Edel; Stage History by Charles H. Shattuck. Boston: Houghton Mifflin, 1974. Vaughan, Alden T. and Virginia Mason Vaughan, Shakespeare's Caliban: A Cultural History. Cambridge: Cambridge UP, 1991. © 1997-, R.G. Siemens (Editor, EMLS).